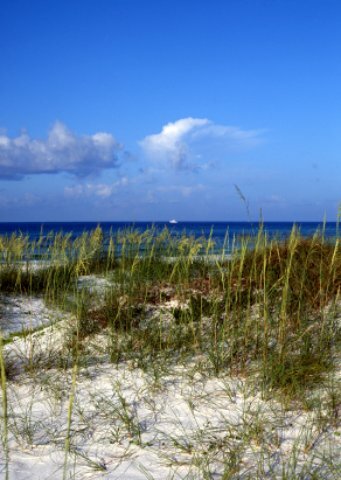 Grayton Beach Florida holds title to being the first of the fabulous fifteen "Beaches of South Walton". Home of Grayton Beach State Park = 400 acres of sheer nature delight! Sand dunes such as these protect the beach from erosion. Walk over or around the sand dunes to a picture perfect beach. However, don't pull the vegetation; it is there to protect beach erosion. This beautiful Florida beach is fairly private and mostly frequented by locals who live here and love this small beachfront community. Visitors may find this beach either too quiet or just perfect depending on the level of stress they brought with them. No distractions on this beach; just veg and enjoy gentle Gulf breezes while your skin takes on that special glow from the sun. In an attempt to describe the style here- it’s a combination of the “original” Florida with a few modern updates, but it still retains its old-fashioned appeal. The city gives off sort of an eclectic mood so no wonder a lot of artsy types reside here. The beach here must be where they come for their inspiration! Bring a book, sunglasses and a spirit that needs revival! It will get that revival here at Grayton! Come one, come all. A visit to the nearby Air Force Armament Museum in Fort Walton Beach will take you on a journey of exploration through a wide array of historical airplane displays. Redbar is the hot spot of the area, where you can experience unique night life, great music, drinks and spirits. Spend a leisurely afternoon exploring Florida’s Gulfarium where you can see alligators, dolphins, sea lions and penguins that perform or are on display. Eating: Dine at Picolo, the home of the Red bar or try Criolla’s, which serves up some tasty Caribbean and Creole creations. Sleeping: Since the town remains so private and reminiscent of Old Florida, there aren’t any hotels located right on the beach. If you’re interested, you can look into a summer condo or house rental or stay in a nearby Destin or Fort Walton Beach hotel like Destin West Beach and Bay Resort.